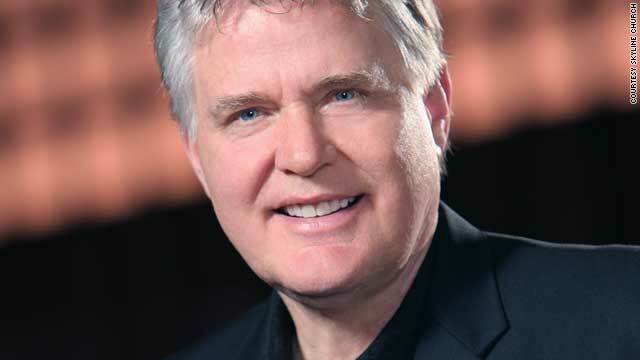 Jim Garlow is the senior pastor at Skyline Wesleyan Church in La Mesa, California. Washington (CNN) - When Pastor Jim Garlow took to the pulpit September 28, he was thinking two things. He first thought that the sermon he was about to give, a sermon in which he was going to endorse a handful of 2012 Republican presidential hopefuls, might earn him a letter from the IRS, possibly even a visit from an agent. By endorsing candidates, Garlow was about to violate the Johnson Amendment, which prohibits tax-exempt churches from engaging in political activity. But according to Garlow, the senior pastor at Skyline Wesleyan Church in La Mesa, California, the conviction that "our nation, economically and morally, is in such a condition that America as we have known it for its 200-plus years is on the verge of disappearing" was enough of an impetus to break the rules. Garlow's sermon was part of a wider effort by the Alliance Defense Fund, a legal organization that since 2008 has hosted Pulpit Freedom Sunday, a day when they encourage and promise to protect pastors who willfully violate the Johnson Amendment and endorse from the pulpit. "We basically see Pulpit Freedom Sunday as a means of protecting a pastor's right to speak freely from the pulpit without fearing government censorship in any way," said Erik Stanley, ADF's senior legal counsel and organizer of Pulpit Freedom Sunday. And so far, the effort has received little to no response from the IRS. Though the agency did not respond to CNN's request for specific numbers, according to Stanley, the majority of the messages go unnoticed and only a handful of pastors receive letters. This trend of non-enforcement has emboldened pastors and the ADF. When Garlow weighed his decision to participate, he said he knew the IRS was not challenging the churches, and that contributed to his willingness to speak. This current loophole of non-enforcement, said the Rev. Barry Lynn, executive director of Americans United for the Separation of Church and State, means Americans can expect a huge jump in endorsements from the pulpit in the 2012 election. "When the Alliance Defense Fund says to churches that the IRS aren't investigating them right now, that gives the churches the sense we can get away with anything," said Lynn, who has been director of Americans United for 20 years. As for the reason for the loophole, it depends on what side you ask. Stanley and the ADF contend that the reason officials aren't investigating is because they don't want to be challenged in court and the IRS may be disorganized. Lynn and Americans United contend that a simple bureaucratic decision as to what level of IRS official can initiate an investigation led to the current loophole. Lynn said that Obama administration has been unwilling to change the regulation. "If it becomes a permanent loophole, this would create a giant loophole for friendly pastors to endorse them and take out ads," Lynn said. According to Naomi Riley, a contributor to Philanthropy Daily, a publication that covers nonprofits like churches, the issue ebbs and flows around elections. "I think the issue heats up as it gets closer to elections," Riley said. "Each side thinks that when another administration is in power they are looking more in the churches than they should be, but obviously Republicans are more worried about Democrats looking to enforce this rule." The current vagueness in policy is new; in the past, the IRS has investigated churches that they thought violated the Johnson Amendment. Four days before the presidential election in 1992, the Landmark Church in Binghamton, New York, ran a full-page ad in USA Today that said, "Christians Beware," and was followed by a list of Clinton's positions on homosexuality, abortion and the distribution of condoms. At the bottom, the church asked for donations to help pay for the ad. According to Lynn, Americans United filed a complaint, and in 1995 the church lost its tax-exempt status. Landmark Church Pastor Dan Little took the IRS to court, arguing that the agency was violating the church's First Amendment rights and that the agency was only able to revoke the tax-exempt status of a "religious organization," not an actual church. Both a federal judge and an appeals court rejected both arguments. In Lynn's opinion, this ruling is evidence that if the IRS enforced the Johnson Amendment, it would be able to revoke church's tax-exempt status. Jeffrey Toobin, CNN's senior legal analyst, is not so sure that there would be a similar result if the IRS initiated another case. "The court is much more hostile to anything that could be interpreted as a restriction on speech and the political realm," Toobin said. "Even if it is the withholding of a subsidy, the Supreme Court is much more favorably inclined towards religious groups than it has been in the recent past." But Toobin acknowledged that without IRS enforcement action, there is no "live controversy" to rule on. Though the numbers taking part in Pulpit Freedom Sunday may continue to grow, unless the IRS goes after a church, none of the churches will have legal standing to bring a lawsuit. "These are values in conflict," Toobin said. "The constitution mandates a degree of separation from church and state. But it also mandates freedom of speech, and this is an example of how society, in the courts, has to sort out apparent conflicts between those ideas." According to Wayne B. Giampietro, the general counsel of the First Amendment Lawyers Association, there is a fine line between a preacher talking as an individual and a preacher speaking for the church. "It is one thing for a preacher to be talking just as an individual," Giampietro said. "He has an absolute right to endorse anyone they want, but once they start saying this comes from the church, that is when you run into problems." This issue arose at last month's Values Voter Summit. Americans United sent a letter to the IRS after Pastor Robert Jeffress, the same pastor in the news recently for calling Mormonism "a cult," endorsed Texas Gov. Rick Perry in his speech and posted that speech on his church's website. Americans United contended that when Jeffress posted the video to the website, it amounted to an endorsement from the church, not just the pastor. Giampietro said he can't predict how the court would go, but he said the IRS has a right to withhold tax exemption from any group, and because there is no right to tax exemption, taking a church's tax exemption away is not violating their First Amendment rights. Back in La Mesa, Pastor Garlow said he plans to participate in Pulpit Freedom Sunday next year. According to Stanley at the Alliance Defense Fund, he will be far from alone. Because of the popularity of the event, organizers are now making it a weekend-long protest so that churches can participate on Saturday and Sunday. Stanley said he expects the number of participating churches to go up again. Garlow's sermon was not specific. "I didn't endorse a singular candidate. I said here are the ones that violate scripture and here are the ones who are in the scope of scripture." After the sermon was over, Garlow said people cheered and asked him why he didn't speak out like this more often. The members of his congregation "were enormously hungry for me to speak out on these issues," Garlow said. But even though the issues Garlow spoke about - gay marriage and abortion - were important to him, he said Pulpit Freedom Sunday represents larger feelings in America. "The bigger picture in all of this is there is a groundswell that is taking place," Garlow said. "... Pastors and people of faith are saying that is it, that is enough, we must speak out." « Previous entryOpinion: Who does God want in the White House? Two issues here. One is the separation of church and state. Be cautious about allowing the church to get involved in politics. Would we want the government involved in religion ? Look at ANY theocratic society to see the results when this overlaps. Second is the tax policy. Should non-religious income to a religious order be tax exempt ? Perhaps this would be an avenue for the government to explore to increase revenue. Property taxes for non-religious property holdings, and income if such property is leased/rented should be fair game. And for those who only believe in that which is proven, proof will cause them to belive. I feel that no church should invove itself in politics. The danger of becoming over zealous is too great. As Christians,we are called to be salt and light, not force and might. Which is the grave danger, should some supposed Christains succeed in their agendas. Let us not be naive about the direction some of the people would like to take us. There are some that are little different from the extremist muslims in what they would like to see enacted into law, here in the U.S., that would be nothing short of moral laws based on their interpetation of the Bible. While many a good Christian might not see much wrong with that, they would leave little room for dissent or nonconformity. Make sure you do not endorse any candidates that are anti-slavery since the bible promotes slavery. I'm not speaking in ignorance but things I have learned over the past 10+ years of my life as a Christian. What have you "learned"? That denying objective and repeatable knowledge is a virtue? That suppression of open inquiry is a strength? That lying to children is moral? That believing in things that you don't (and can't) understand will bring you favor? That the tenacious myths of people who didn't even know where the sun went at night should be the foundation of your life? That iis not learning, it is self-imposed stultification. Christianity is ignorance. You ignore the total lack of evidence for anything you believe in. You ignore the huge mountains of evidence for the things you and your Christianity don't believe in. Ignorance, plain and simple. From that famous passage: In 1 Corinthians 15 St. Paul reasoned, "If Christ has not been raised, our preaching is useless and so is your faith." Even now Catholic/Christian professors of theology are questioning the bodily resurrection of the simple, preacher man aka Jesus. "Heaven is a Spirit state or spiritual reality of union with God in love, without earthly – earth bound distractions. Jesus and Mary's bodies are therefore not in Heaven. Most believe that it to mean that the personal spiritual self that survives death is in continuity with the self we were while living on earth as an embodied person. Again, the physical Resurrection (meaning a resuscitated corpse returning to life), Ascension (of Jesus' crucified corpse), and Assumption (Mary's corpse) into heaven did not take place. The Ascension symbolizes the end of Jesus' earthly ministry and the beginning of the Church. Only Luke's Gospel records it. The Assumption ties Jesus' mission to Pentecost and missionary activity of Jesus' followers The Assumption has multiple layers of symbolism, some are related to Mary's special role as "Christ bearer" (theotokos). It does not seem fitting that Mary, the body of Jesus' Virgin-Mother (another biblically based symbol found in Luke 1) would be derived by worms upon her death. Mary's assumption also shows God's positive regard, not only for Christ's male body, but also for female bodies." "
"In three controversial Wednesday Audiences, Pope John Paul II pointed out that the essential characteristic of heaven, hell or purgatory is that they are states of being of a spirit (angel/demon) or human soul, rather than places, as commonly perceived and represented in human language. This language of place is, according to the Pope, inadequate to describe the realities involved, since it is tied to the temporal order in which this world and we exist. In this he is applying the philosophical categories used by the Church in her theology and saying what St. Thomas Aquinas said long before him." The Vatican quickly embellished this story with a lot CYAP. Of course, we all know that angels are really mythical "pretty wingie talking thingies". "Reimarus (1774-1778) posits that Jesus became sidetracked by embracing a political position, sought to force God's hand and that he died alone deserted by his disciples. What began as a call for repentance ended up as a misguided attempt to usher in the earthly political kingdom of God. After Jesus' failure and death, his disciples stole his body and declared his resurrection in order to maintain their financial security and ensure themselves some standing." Even so, asking historical questions is our responsibility. Did Jesus really rise from the tomb? Is it necessary to have been raised from the tomb and to appear to his disciples in order to explain the rise of early church and the transcription of the bible? Crossan answers no, Wright answers, yes. " You are right, Ridge. The book of Acts is not a book of studies; it is a book of the work of the Holy Spirit tuhrogh His faithful disciples Jews and Gentiles. For many today, "What is God doing in (through) your life?" is an embarrassing, even intrusive and unwelcome inquiry. The story of redemption is the story of changed lives always changing. We don't stop at conversion. We should never suggest that at conversion, one has his "ticket" and now all that is necessary is some Bible study and "fellowship." I am glad InFaith emphasizes the use of all the believer's gifts, in every capacity, in every locality, led and empowered by the Holy Spirit. And yes, there is always a cost, for that which is valuable. Even children who give their hearts to God are not too young to begin searching for their gifts and callings. Please, oh please, just stop already. Then please seek professional help....or read a book (other than the bible). To all of you who have been responding to these comments. Thank you, this gives me the chance to really reaffirm my faith and dig deeper into things. I really enjoy talking with you and I know this article was a bout a pastor wanting to tell his congregation about who to vote for but I didn't care about that more then I care about the other questions that were going on.